Who would think that watching a show about a motorcycle club would have me looking at my own life and analyzing it? 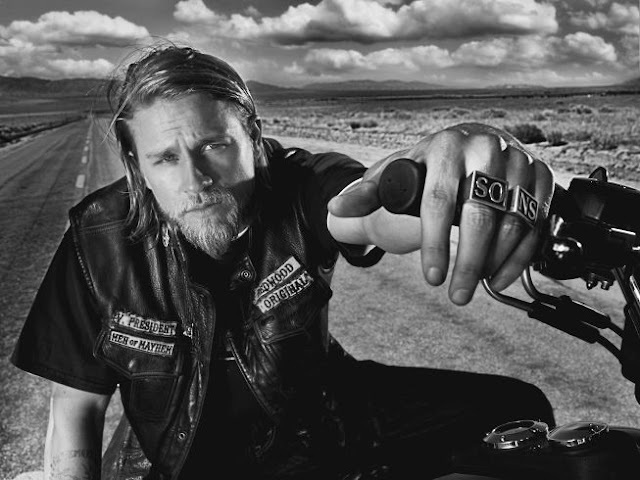 I've spent days and nights binge watching SOA on Netflix wondering why it has effected me so. I don't care for motorcycles given my limited time attempting to ride one but I love these brothers like they were my own. When it comes to family, whether you are in a MC or driving a minivan, your choices you make in life will always lead you down different paths. Granted, whacking someone because they crossed you isn't the way I'd handle it. However, watching Jackson Teller become a dad and dealing with Samcro and his family taught me a few things along the way about what it means to be a man. 1. Don't be afraid to hug anyone and everyone, especially your male friends. 2. Spoil your kids occasionally because before you know it their childhood will be passing you by and you'll wonder where it went. 3. Let others know how much you mean to them daily. 4. Stick to the truth and as long as you do that, you'll be doing the right thing. 7. Learn to be a good listener. Sometimes it is better to listen than to say anything. 9. ...except when she isn't. 11. Keep passion and laughter in your relationship, both are important. Good points, but the real reason I read this post is because I have been binge watching SOA, too. I have gotten addicted to that series and I am afraid of what I would do when it ends. I am going on season 6.